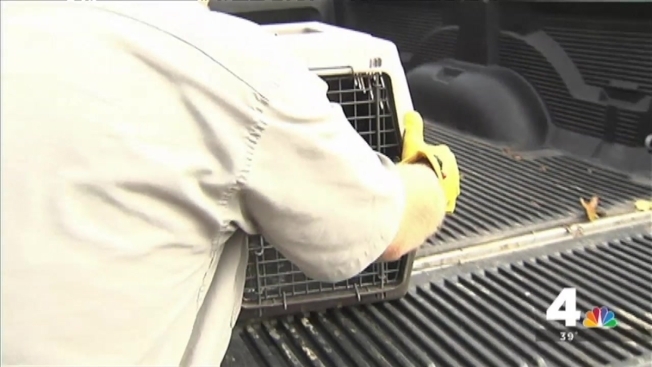 Federal agents have removed or chased away more than 100,000 animals from areas near the runways of BWI-Thurgood Marshall, Reagan National and Dulles International airports in the past year, according to a review by the News4 I-Team. The animal removal efforts are necessary to reduce the risk of dangerous or deadly mishaps with airplanes. In about five percent of cases, the agents were forced to euthanize the animals to prevent those animals from striking a plane. Concern about damaging bird strikes against airplanes has grown in recent years, in the wake of a frightening incident aboard US Airways Flight 1549 in 2009. The plane, after suffering bird strikes to each engine, was forced to make an emergency landing in the Hudson River. All of the passengers were safely and successfully rescued. A bird strike to a plane engine also disabled a flight near BWI airport earlier this month. The I-Team’s review of FAA reports shows about 70 planes in Virginia and Maryland have been damaged by animal strikes since 2009. In some cases, the damage was deemed significant. There are no reports of fatalities, but congregations of birds are common near water and plants by all three major DC-area airports. Safety advocates, including Maryann Bruce, a passenger aboard US Airways Flight 1549 have urged federal regulators to more aggressively work to remove animals from areas near US airports. But some Congressional leaders have questioned the methods used those by federal agents, including euthanizing. Rep. Jim Moran (D-Va.) has asked the Federal Aviation Administration to require airports deploy new avian radar technology, which is being tested in Seattle and Dallas, to alert planes about bird flocks near runways. Moran said the usage of avian radar would reduce the need to euthanize animals. "What they're doing is the crude thing, slaughtering birds that live in the vicinity," Moran said. But federal regulators have not committed to do so. In a statement issued to Moran’s office and to the News-4 I-Team. “The FAA does not have the statutory authority to require avian radar as a mandatory safety requirement. Nor do we believe there is enough information available to warrant making it mandatory," the head of the Federal Aviation Administration said. A spokeswoman for the US Department of Agriculture’s Animal and Plant Health Inspection Service said the euthanizing of animals is a last resort, to prevent imminent airplane strikes or to remove animals that cannot otherwise be chased away. Bruce, a passenger on US Airways Flight 1549, said lawmakers and federal regulators should find consensus and use thorough methods to reduce strikes. "I'd like to think better heads would prevail. Get [the birds] out of the pathway," Bruce said. The federal government’s program to remove birds, deer and other animals from the grounds of US airports began in the 1950s, shifting in the 1980s from the US Department of Interior to the US Department of Agriculture.